Malaria Consortium in Myanmar supports the Ministry of Health to provide technical assistance in developing a centralised systematic and integrated database of malaria data to help respond to the urgent need to improved malaria surveillance information for National Malaria Control Programme and non-governmental organisations. The data are accessible to the central staff, allow efficient extraction of key indicators, facilitate data analysis and provide an early detection of trends and outbreaks. We also conduct large-scale surveys and address indicators for the containment of artemisinin resistance and malaria elimination to help redefine malaria risk stratification nationally and better prioritise malaria services to areas of greatest malaria burden. 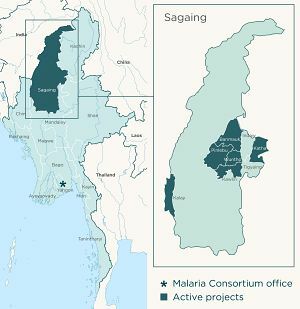 We engage with World Health Organization Emergency Response to Artemisinin Resistance (ERAR) to assess the current surveillance system of malaria outbreak response in the Greater Mekong Subregion. We also assess the performance evaluation of village health volunteer management. In addition, Malaria Consortium in Myanmar provides data analysis and a comprehensive surveillance implementation strategy on dengue. Malaria Consortium in Myanmar supports the Vector Borne Disease Control Programme to develop and refine strategies for artemisinin resistance containment. As part of this support, we focus on strengthening the ability of health systems and the communities to prevent the spread of vector-borne diseases more effectively. Our activities include delivering behavioural change campaigns at the community level and improving surveillance capacities. We also provide integrated community case management (iCCM) as a strategic link with Myanmar's National Health Plan to improve simple public health services to remote, vulnerable, and ethnic populations by using existing community health structures (such as village health workers and midwives) to work towards a sustainable community-based approach to reducing child mortality. Malaria Consortium in Myanmar supports the national programme by providing capacity building in behavioural change communication strategies and in monitoring and evaluation methods. We work closely with local staff in the development and application of training tools for different cadres of health workers involved in malaria control and prevention. In addition, Malaria Consortium Myanmar provides technical assistance to the Vector Borne Diseases department with the aim of improving the capacity of dengue staff with regards to implementing policies and procedures. Malaria Consortium in Myanmar supports research to fill knowledge gaps and ensure that strategies are evidence-based. The Myanmar office implemented a programme to support various insecticide prevention activities including an assessment to help countries update and rationalise national strategies for vector control – particularly in the use of long lasting insecticide nets (LLINs) – as well as other insecticide treated materials and repellents. Malaria Consortium’s activities include behavioural research to understand consumer preferences and barriers to the use of LLINs in Myanmar, rapid coverage monitoring of net distribution, qualitative assessment of personal protection measures and behaviours of at-risk populations.